In the late 90’s NASA at Marshall Space Flight Center designed and constructed a central chilled water plant with underground distribution piping to various buildings. The central chilled water plant contained (9) 1250 ton centrifugal chillers which have been in operation since the building was constructed. 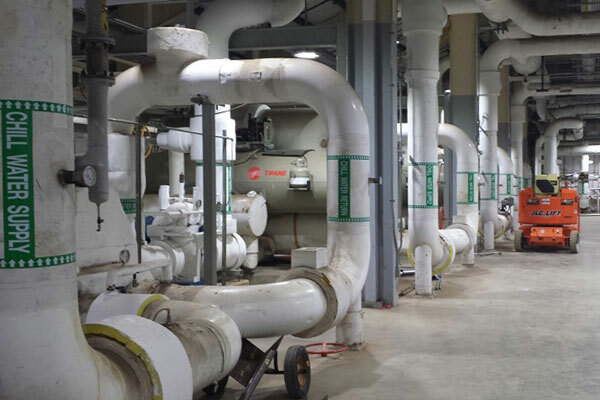 Due to the age of the chillers and limited availability of the refrigerant they utilize, NASA decided to revitalize their chilled water plant. This project consist of replacing all (9) of the 1250 ton existing chillers with (8) new 1250 ton chillers as well as (2) smaller 350 ton chillers which required (2) smaller pumps as well. Two of the new 1250 ton chillers are being equipped with variable speed drives for energy conservation. The new chillers are also designed to contain a certain type of refrigerant not all manufacturers are using yet. As part of this project the electrical power feeds and controls systems for chiller operation will also be updated. A new addition to the building which will house a new switchgear, variable frequency drives, and electrical panels is also included in our scope of work. Due to the year round operation of the plant the change outs are phased so that only (2) chillers are not in operation at any given time. This challenge makes planning and coordination of each element involved a major part of the completion and success of this project.